I wrote this tome because Nemo wanted my input to help another MyMac writer write a review of a pair of headphones. Nemo asked, so for better or worse (mostly worse), here’s what I threw together at 2AM one night/morning last week. Headphones will always suffer from one major factor–true bass response. When using conventional speakers, especially in the bass range, you not only hear the notes, but your whole body feels them, especially if you like to play your system on the loud side, as the speaker (maybe a subwoofer if you are fortunate to have one) is moving a lot of air around. Not so with headphones, which limit the experience to your eardrums, and I guess inducing some of that energy into your jaws (hence the popular jaw conduction Bluetooth earpieces for your favorite cellphones). True, the lower the bass side of the frequency response curve goes, the lower, theoretically, you should be able to hear. Likewise the higher the frequency range, theoretically, the higher you will be able to hear. Truth is, most headphones are capable of relatively flat response (by flat, I mean minimal variation in level, usually measured in decibels or dB) from 20 Hz to 20 kHz–it helps that the transducer (speaker) is so close to your ear. A headphone transducer may be able to reproduce sounds going as low as 5 Hz, but you won’t be able to hear those sounds. 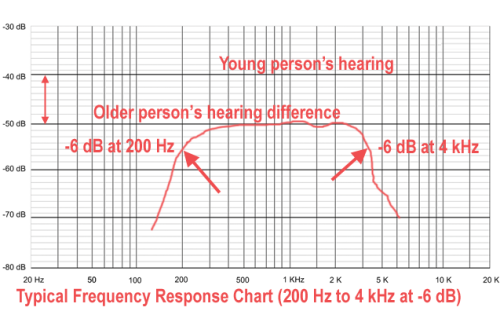 The human ear of a younger person (say, 15 to 30), providing that hearing hasn’t been damaged by too much time at dance clubs, or playing their iPods at excessive levels, can probably hear reliably well from 20-30 Hz on the low end to somewhere above 18 kHz on the high end, with response falling off at the 30 Hz and 18 kHz by at least 3 dB (decibels). A 3 dB reduction in response (or output), in this context, means that you can only hear half as much as you can at, say 1 kHz. Further complicating things, if you listen to music extracted entirely from CDs, response above about 20 kHz is superfluous, as CD players use a very steep filter to cut off audio above 20 kHz, to ensure no harmonic output from the music interferes with the 44 kHz sampling rate used by CDs. In essence, anything that comes from a CD has absolutely nothing above 20 kHz (or below 20 Hz). Besides, in the real world, very, very few humans can hear that high anyway (that’s reserved for dogs who can hear to 50 kHz or higher). Even with LPs, very, very few LPs ever recorded anything as low as 5 Hz at a high level (some of the experimental direct-to-disc recordings from the 1970s and 1980s from Sheffield Labs or Cerwin-Vega’s earthquake record notwithstanding). When attempting to reproduce high energy, low frequency sounds, most cheap styluses jump out of the grooves, and even the best often have difficulty traversing through those passages. At the extreme high frequencies, after you have played a passage containing energy at or near 20 kHz a few times, those very highest frequencies will probably be worn off the groove, unless you are using a very high end phono cartridge costing many hundreds (or thousands) of dollars. Seriously, there really isn’t a whole lot of music that high up, or that low, either. The illustration below is exaggerated, as few items have a frequency response that flat, but it illustrates the point that a CD player cannot reproduce anything below 20 Hz or above 20 kHz. SIDEBAR: Wikipedia defines decibels as a logarithmic unit used to express the ratio of two values of a physical quantity, often power or intensity. In other words, every 3 dB change results in a halving or doubling of power. Every 6 dB change results in either quartering or quadrupling of power. Every 10 dB change results in a ten times change. Measured on an audio curve, if a portion of the audio spectrum’s output is 3 dB lower than the reference point (0 dB), that part of the spectrum is half as loud as output at the 0 dB reference point (often measured at 1.0 kHz). If that chunk of audio is 10 dB lower than the reference point, it’s ten times less loud than audio at that reference point. Finally, if that chunk of audio is 20 dB lower in level than the 0 dB reference point, it’s 100 times less loud than the audio at the reference point. Put another way, you would need to increase the power by 100 times to bring something that’s 20 dB below the reference point up to the reference point’s output. Speakers, being nonlinear devices, can induce their own distortions. What you may think is a 25 Hz bass note, is most likely a doubling, also known as second harmonic distortion, or, in this example, 50 Hz (which coincidentally falls more within the normal hearing range of average humans). An example of this is the hum you sometimes experience in your audio gear if things aren’t well grounded (earthed–for my UK friends). You are seldom hearing the fundamental electrical power frequency of 50 Hz (UK/Europe) or 60 Hz (US/Japan). Instead, most often, you are hearing the second harmonic (100 Hz in UK, and 120 Hz in US). Musical instruments generate many different harmonics themselves, some pleasing, some not so much. A triangle may ring in with a frequency of a couple of kHz, but it also generates multiple harmonics, ranging up toward 15-20 kHz. Synthesizers are the odd man out, as they can indeed generate audio at the extreme ranges of human hearing (and beyond), and when music generated by synthesizers containing significant energy at the extremes of the audible spectrum is played really loudly, you are asking for either damaged amplifiers, damaged speakers, or really damaged hearing. The older you get, the worse your hearing gets at those extremes, so that when you are 45, hearing response of audio at the extremes of 30 Hz and 20 kHz may be down 6 to 10 dB (from four to ten times worse ability to hear those sounds). In my case, at age 61, after some years flying in the back of C-130 and C-141 cargo planes, as well as playing at screamingly and appallingly high volume using various personal audio devices, as far back as the very first Sony Walkman, my overall hearing is down probably 6-10 dB from what it was in my 20s (see graph below), with worse response at the extreme high and low ends. My guess is that the flattest part of my hearing range is probably from 150 Hz to maybe 5 kHz. I spend a lot more time saying “huh?” these days. 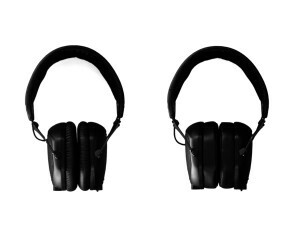 Unless your headphones have multiple drivers in each earpiece, designed to approximate what you hear in a room, the experience is going to be a tad more sterile, as room reflections, the way sound in your listening room reacts to carpeting, tile floors, wall decorations (or not), play a huge role in your perception of music, are not going to be experienced when listening with headphones (unless the manufacturer has come up with some sonic trickery to fool your brain into thinking you’re listening in open space, and some have). Unless you have some anatomical peculiarities in your hearing mechanism, you are likely never going to be able to hear 5 Hz (though you might feel it). 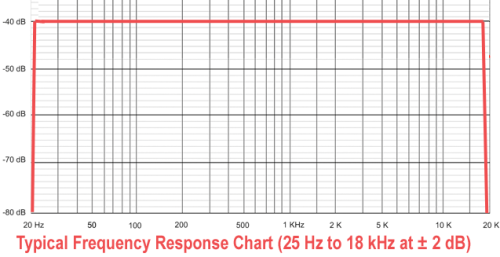 You should probably look at the frequency response chart and see how far from the flattest part of the frequency response graph that 5 Hz is. Because audio device manufacturers can pretty much say anything they want, audio at the audible extremes could be down 10 dB or worse. 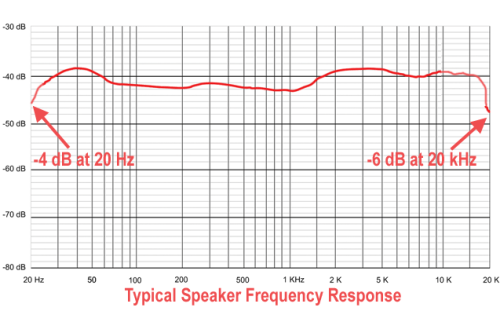 Be very skeptical when manufacturers rate any loudspeaker device with output below 20 Hz. If you are reviewing headphones, you probably need to first be well versed with conventional loudspeakers, and need to take a serious listen to them. Learn that the “specs” are nothing but marketing hype. A speaker/headphone with “perfect” 20 Hz to 20 kHz response, plus or minus 1 dB (a very rare thing), may sound like complete garbage next to a speaker with an advertised frequency response of 50 Hz to 15 kHz, plus or minus 6 dB, which may sound completely brilliant. Distortion, which may or may not be measured, can change your listening experience from sheer nirvana to punishment (also known as listener fatigue). If an otherwise great looking speaker (from a specifications standpoint) makes you want to poke an icepick through your eyes to stop the pain, it’s no good, no matter how well it measures. Nemo is absolutely right. Write about what you hear, not so much how it measures. Is it musical? Are there any rattles, buzzes, or other distortions? Does it make you want to sit back and listen for hours at a time, or does it make you want to hurl it against a wall so it shatters into a million pieces? Special note to reviewers: If you are expected to return the device to the manufacturer, please, please do not hurl it against the wall in a green-skinned raging fury. It makes it so much harder for Nemo to get other manufacturers to loan us gear for testing. Because speakers are mechanical devices with coils that rub up and down within a magnetic field, several different kinds of distortion can be present: harmonic, and intermodulation (look it up, I’m tired, and this article is way too long now, anyway) for a start. So, in summary, most people can’t hear down to 5 Hz, or for that matter, up to 20 kHz. Anything that originated from a CD starts at 20 Hz and stops at 20 kHz. Converting to an MP3 may cause frequency response to suffer, too, as the mathematical algorithms used to reduce the file sizes of MP3s over the original AIFF files (on a CD) tend to eliminate sounds that “most people can’t hear.” I think this is one reason more and more audiophiles are rethinking their portable audio and are moving to lossless formats like FLAC. Bass notes over headphones lack the whole body feel since a headphone speaker can’t move nearly that much air (and can really damage your hearing if played too loudly). The older you get, the less you can hear (see previous sentence). Hope this made some sense. I’m off my meds now, so I’m not always sure. Reviewing headphones – getting past the criticisms and brickbats with a fairly accurate evaluation, is very hard. I read somewhere where someone said that making secure encryption is very hard. Probably one of the RSA guys. So, good advice.